A Painter´s Life on Planet Goodaboom: Back again on Planet Goodaboom! Back again on Planet Goodaboom! 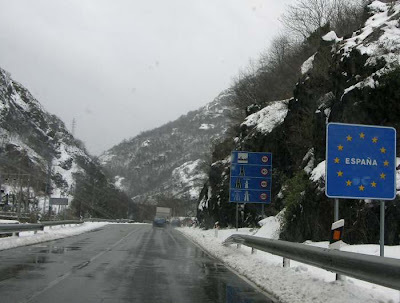 Yes, we are back home, and this is the way it looked as we entered Spain on the 21st of March in the middle of the afternoon. And you won´t believe it, but some hours later, as we drove through a region called "El Maestrazgo", about 300km south of Madrid, the car thermometer was showing - 6°C outside! So people, if you consider moving to Spain because of sea and sunshine, better stay home... anyway, already too many people are living here, it´s becoming insane! Better regularly read our diaries and get the taste of Spain from a distance! Kevin will surely soon make a word and photo reportage of our travel to Germany and to France, so keep an eye out for our travelogue. It will be so difficult now to go back to them, I have completely lost the personal relationship I had established with them while I was painting them, absolutely necessary to make a good, lively portrait. But well, I am not so worried, I just need to make the first step, sit in front of one portrait, empty my mind concentrating only on the child and start. But well, this tiny step, at the moment, appears to me like a giant one! But it will be wonderful to paint again, after 10 days artistic inactivity. I deeply miss it. I guess, the best thing is to start at once! Also: write to you soon again!